When professional painters are tasked with painting a front door, they put their best painter on the job. This is because your front door is the first thing people see just before they enter your house. It’s the first thing you see when you enter your house. If the front door looks streaky and badly painted, it throws off the whole feel of the house and its paint job. Painters are very careful with front doors because if they mess it up, no matter how well they painted the rest of the house, their customers won’t be happy. If you’re planning on painting your front door yourself, make sure you have the proper brushes and try to keep your brushstrokes going in the same direction as much as possible. Also, don’t be shy about using up your paint. You’ll need good coverage for your door. But a question that often comes up, especially for DIY enthusiasts, is whether to paint or stain the front door. You can find excellent examples of both on many houses, as well as bad examples. 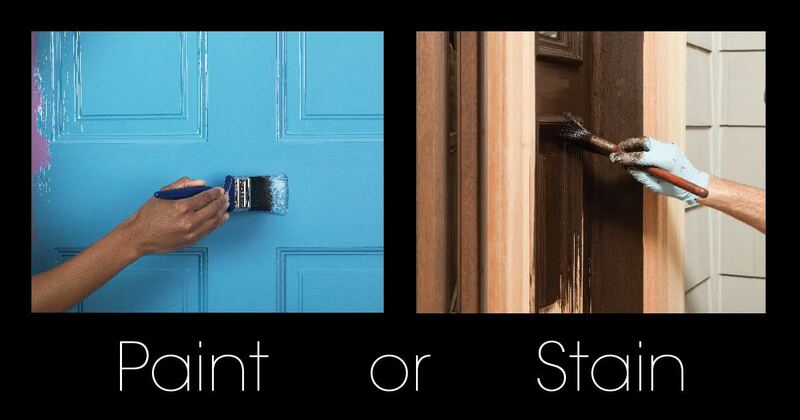 How do you know if you should stain, rather than paint, your front door, or vice versa? First is a practical consideration: how much sun does your front door get? If the door faces south, for instance, and gets many hours of full sun every day, you’ll need to re-stain even with proper sealing in a few years. Darker or lighter stains will need to be redone all the same. Both paints and stains will protect your wood from the sun, but they’ll both be affected by direct sun exposure. Paint will fade over time, as well, but it usually takes longer to notice the effect of the sun on it. If durability is a concern, with many people coming in and out, or if you have an old door on an old doorframe, paint is usually the way to go. Staining, even with proper sealing, can peel, chip, or flake off with too much abuse. Paint, too, isn’t impervious, but it’s generally more durable than stains. How Beautiful is Your Wood? People change their minds many times over the course of owning their home. Many people are in love with their door’s wood grain or pattern, but might decide to paint over it anyway after a while. If you know you want to see your door’s wood grain pattern over the long term, then staining is the way to go. You can still recover your door’s natural wood look after you paint it, but it will be much more difficult to return it to its former glory if you paint it. No matter which way you decide to go, contact Ireland’s Finest Painters to see how we can help you get the most out of your next painting project.